Tessa Longbons | February 21, 2018. Missouri’s annual abortion report for 2016 shows that abortion is declining in the Show-Me State, while Missouri residents continue to get abortions in neighboring states. Published online in January by the Department of Health and Senior Services, the report comprises eight pages in the state’s vital statistics report. *Total abortions occurring in Missouri. Separately, Missouri also reports abortions performed on Missouri residents both inside and outside the state. Missouri’s state abortion rate and Planned Parenthood’s Missouri market share are not publicly available. Missouri reports the total number of abortions performed in the state and the number of abortions performed on Missouri residents, both in and outside Missouri. In 2016, 4,562 abortions were performed in Missouri, a decline of four percent from 2015 (Figure 1). At the same time, a total of 7,275 abortions were performed on Missouri residents, down three percent from the year before (Figure 2). Abortion occurrence in Missouri has dropped by 55 percent since 1975, when the state first began reporting abortion statistics. Abortions to Missouri residents have fallen by 34 percent since 1975. Chemical abortions occurring in the state fell by three percent from 1,263 in 2015 to 1,226 in 2016. 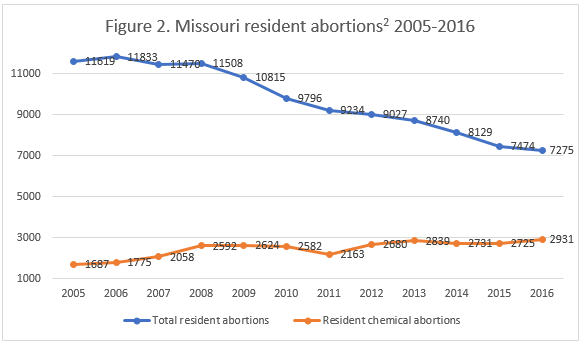 Total chemical abortions performed on Missouri residents in and out-of-state, however, increased by almost eight percent. 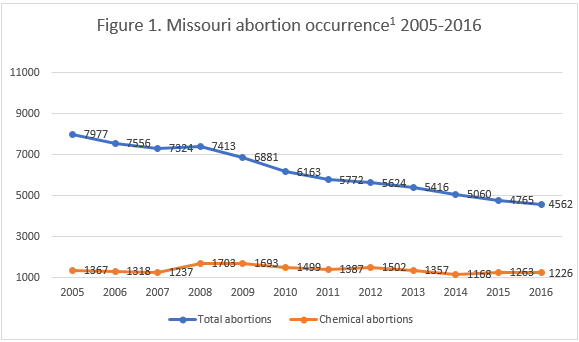 Missouri has tracked chemical abortions since 1999, when 13 chemical abortions were performed in the state. 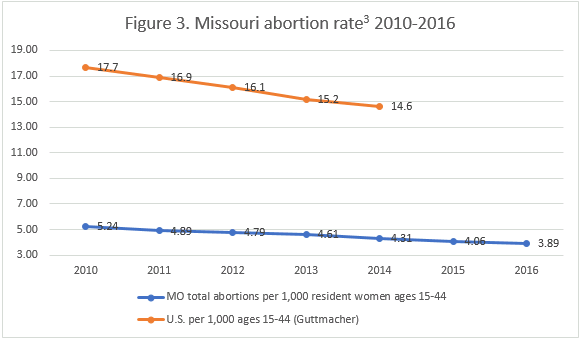 Missouri does not report the state abortion rate, although the Charlotte Lozier Institute estimates a rate of 3.9 abortions per 1,000 women of childbearing age – a slight decrease from 2015 (Figure 3). Missouri reports the characteristics of women who undergo abortions in the state, regardless of their state of residence. It does not indicate how many of the abortions occurring in Missouri were performed on Missouri residents. Sixty-two percent of the women who obtained abortions in Missouri were in their twenties. Ten percent were 19 or younger, 26 percent were in their thirties, and three percent were 40 or older. Forty-seven percent of the abortions performed in Missouri were performed on white women. Most of the abortions performed in Missouri occurred early in pregnancy—49 percent were performed at less than nine weeks gestation, 34 percent between nine and 12 weeks, not quite 14 percent between 13 and 19 weeks, and almost four percent at 20 weeks or later. Fifty-seven abortions were performed at 20 weeks gestation, and 109 were performed at 21 weeks gestation or even later in pregnancy. Separately, Missouri also reports the characteristics of resident women who obtain abortions, whether they get abortions in Missouri or in a different state. However, Missouri does not report which states the abortions occurred in. Therefore, it is impossible to tell how many Missouri residents underwent their abortions in Missouri and how many traveled to other states. Resident women’s ages were similar to the ages of women getting abortions in Missouri, with nine percent aged 19 or younger, 60 percent in their twenties, 27 percent in their thirties, and three percent 40 or older. Fifty-one percent of Missouri residents undergoing abortion were white. It appears that most resident women had graduated from high school but not from college—12 percent completed 11 or fewer years of education, 37 percent completed 12 years, 27 percent finished between 13 and 15 years of schooling, and 15 percent had completed 16 years or more. The educational level of eight percent of resident women was unknown. A high majority, 85 percent, of resident women who had an abortion were not married. The majority of Missourians had previously given birth, with 26 percent having one living child and 35 percent with two or more living children. Sixty-three percent of Missouri women who had an abortion in 2016 had not had any previous abortions. Twenty-four percent (1,746 women) had had one previous abortion, and 13 percent (945 women) had had two or more previous abortions. Missouri reports marital status, level of education, and previous pregnancies for resident women only. Missouri residents were likely to undergo abortions early in pregnancy: 56 percent of the abortions performed on Missouri women occurred at less than nine weeks gestation, 30 percent between nine and 12 weeks gestation, 11 percent between 13 and 19 weeks, and two percent at 20 weeks or later. Missouri currently permits elective abortions until viability, which is typically around 24 weeks gestation. Before performing an abortion on a baby that is 20 weeks gestation or older, doctors in Missouri must test for viability. Abortions after viability are allowed only when the life or physical health of the mother is at risk, and abortions after 16 weeks gestation must be performed in a hospital. However, most adjacent states, excluding Illinois and Tennessee, prohibit elective abortions after 20 weeks post-fertilization (approximately 22 weeks gestation, or five months of pregnancy). Because of this, it is likely that many of the later abortions performed on Missouri residents occurred in Missouri. As noted above, Missouri reports that in 2016, a total of 7,275 resident women obtained abortions, while 4,562 abortions were performed in the state. Consequently, many resident women must have obtained their abortions in other states. Missouri’s estimates of the true number of resident women seeking abortions out-of-state are even higher. Illinois does not report the number of Missouri women undergoing abortions in the state. By approximating the number of Missouri residents seeking abortion in Illinois, Missouri estimates that the actual total number of abortions performed on resident women in 2016 was 8,496. However, future reports may reflect a shift in the number of Missouri women getting abortions in other states. For years, only one abortion clinic operated in Missouri, but in the summer of 2017, Planned Parenthood announced plans to offer abortions at two additional sites, bringing the state’s total to three abortion clinics, with others to potentially offer abortion in the future. Currently, two Planned Parenthood health centers in Missouri advertise abortions, while a third announced that it was offering chemical abortions, although it has not listed abortion services on its website. However, Missouri recently strengthened its informed consent law, which could also affect where women choose to get abortions. In a study on state abortion reporting by the Charlotte Lozier Institute, Missouri’s reports tied for 25th best out of the 50 states, the District of Columbia, and New York City. Missouri could make its reporting clearer by including the percentage of abortions to nonresidents occurring in the state. This would allow for the comparison of resident abortions performed in the state, nonresident abortions performed in the state, and resident abortions performed outside the state. Missouri could also improve its reporting by providing information on any complications or injuries resulting from abortion. Additionally, Missouri could start reporting data related to the state’s informed consent and parental consent processes as several other states do. The new abortion facilities operating in Missouri could affect abortion incidence in the state, making clear and accurate abortion reporting even more valuable to researchers and concerned citizens alike. The total number of abortions for 2011 and 2014 given in the 2016 abortion report vary slightly from the totals given in the 2011 and 2014 abortion reports. While no explanation for this discrepancy is provided in the 2016 report, it records a slightly higher total for 2014 and a slightly lower total for 2011. Because the 2016 report contains only the total number of abortions for the past several years and not chemical abortions, the totals provided by the 2011 and 2014 abortion reports have been used to allow for comparison with chemical abortions. Missouri reports resident abortions obtained in-state and resident abortions obtained out-of-state as one total. It is unknown what the breakdown is between how many resident abortions occurred in Missouri and how many occurred in other states. Missouri does not report the state abortion rate. Rates were calculated by the Charlotte Lozier Institute using population estimates from the United States Census Bureau. The rates were calculated using the following formula: (total number of abortions performed in Missouri ÷ number of resident women ages 15-44) x 1,000. The total numbers of abortions for the years 2010-2016 provided in the 2015 and 2016 abortion reports were used.